Poker tournaments present the opportunity to achieve a big payday for a reasonably sized investment. Everyone’s chances of winning aren’t equal though: Those who know what they’re doing will take home the lion’s share of the prize pool. There are plenty of factors you need to take into account when debating your plays in an MTT, including stack size, the number of players remaining, and the payout structure. We’ll show you how to consider these elements, in conjunction with the cards you hold, to make decisions with positive expected value. The articles below are pretty informative whether you’re a freeroller or someone who pays thousands of dollars to enter major tourney events. There are only a few situations in poker tournaments where small pocket pairs are valuable. You can try to set-mine if stacks are deep. If stacks are short, you may be able to go all-in with small pocket pairs and still have good equity against typical calling ranges. AK is, without a doubt, an excellent hand. It is ahead or flipping against every hand except AA and KK. Nevertheless, you should exercise caution with AK if there are multiple raises in front of you. If there are folds, limpers or a single raise in front of you, you should absolutely play it. As any poker player does, you will suffer your share of bad beats in tournaments. It’s important to have a proper bankroll management strategy and sufficient emotional fortitude to survive to see the long-term rewards of your superior play. Always evaluate your draws carefully. Sometimes, it’s valuable to go over your completed poker tournaments with a hand-history viewer to analyze spots that you are unsure about and identify errors in play. You can use a replayer that automatically cuts out hands that you folded preflop so that you can focus on the important hands. A tricky spot in poker tournaments is deciding whether to call when your opponent has gone all-in. You need to carefully consider the pot odds to determine how much equity you need to proceed. Then compare your hand against his range to find out if you have the needed equity. World Series of Poker action sees some talented players square off against each other. By examining the televised hands, we can often gain insights into excellent plays and boneheaded mistakes that the pros make. It’s very important to extract as much value as you can with your monsters. 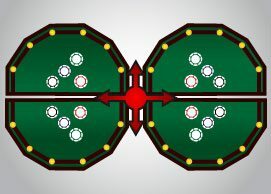 There are many different poker tournament structures that are common today. You need to evaluate the structure in any given MTT to determine how your strategy should change. The depth of the starting stacks (in big blinds) is an especially important factor to consider.